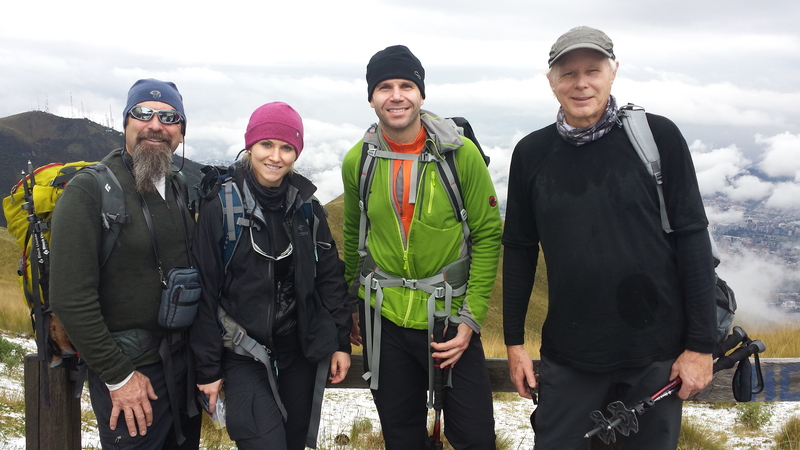 Yeah, this is Randall, Bailey, Bill, and Doug, and Jose Luis in Ecuador. Yesterday we went on a walking tour and bus tour of Quito, the old district, all the old churches in the area. Today we took an acclimatization hike outside of Quito to about 15,000 feet and experienced an Ecuadorian thunder shower with hail and rain and thunder. We are all doing well, having a great time. The food is wonderful and everybody is going to go to bed now. We’ll check in with you guys tomorrow. Love from all of us to all of the familia and amigos in America, bye bye.